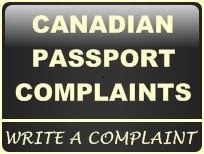 Do you have any complaints against Passport Canada? We would like to hear your complaints. Use the following comment box to publish your complaint. Please do not publish personal information here. Thanks. Are you ready for June 1 deadline? As of June 1, all travelers entering the United States by land or sea will need a passport. They already need them to travel to the United States by air. Canadian government confirmed this week it is prepared for the June 1 deadline. Close to 75 per cent of all adult Canadians hold passports. But only 35 per cent people in New Brunswick have passports. Passport Canada says it's ready for an anticipated spike in applications as New Brunswickers and other Canadians suddenly realize they're running out of time. The mobile passport unit is going to places that are not near a passport office. Are you ready for June 1? Get your Passport..
Officials from the Passport Canada Mobile Passport Unit will be in Abbotsford on April 6 2009 at Coast Abbotsford Hotel & Suites 2020, Sumas Way Abbotsford, BC. They will review and accept completed passport applications. acceptable methods of fee payment at these clinics will be certified cheque, money order (postal or bank) made payable to the "Receiver General for Canada". All canadian need a valid passport to enter the United States under the Western Hemisphere Travel Initiative (WHTI).